JAY GOULD (1836-1892). Gould, a railroad magnate, financier and a stock market manipulator, began his rise by controlling a small Vermont railroad in 1860. Over the next decade, he made a fortune by buying and selling railroads and manipulating their stock. His most famous railroad battle came in the late 1860s when, along with Jim Fisk and Daniel Drew, he struggled for control of the Erie Railroad against "Commodore" Vanderbilt. Gould went on to become "the most hated man in America" when his attempt to corner the gold market caused a panic termed "Black Friday" in September 1869. Turning towards Western railroads in the 1870s, he came to own or control numerous roads, including the Union Pacific and Kansas Pacific. It is estimated that he controlled about 10% of the American railroad track by 1880. He went on to gain control of the Western Union Telegraph Company and the New York elevated railroad before his premature death. 1865, New York. Stock certificate for 360 shares. Light purple text on white paper with attached adhesive revenue at bottom. Signed as President by Jay Gould (1836 - 1892) Railroad magnate; Financier; Stock market manipulator. 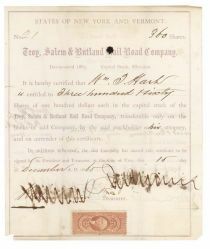 Issued to and signed on verso by William T. Hart, one of Gould's earliest railroad business partners. Minor paper loss at lower left and right corners. Ink spot affecting the R in the company title. Overall age toning, very good. Ink cancelled through Gould's signature and shows smudging. Hart's signature has bleed-through from this on verso. 1867, New York. Stock certificate for 100 shares. Black with Company name in red. Attached adhesive revenue at lower left. 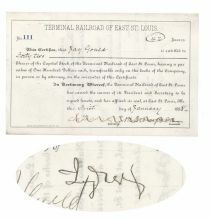 Issued to and signed on verso by Jay Gould (1836 - 1892); railroad magnate, financier, stock market manipulator. Fine condition. Pen cancelled. 1879, Kansas. 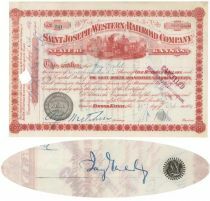 Stock certificate for 100 shares in the St. Joseph & Western RR Co. Red. Vignette at top center of a train departing a station. Issued to Jay Gould and signed by him on verso. JAY GOULD (1836-1892). Railroad magnate; Financier and Stock market manipulator. Stamp and diamond cut cancelled, Gould’s strong signature is unaffected. Very Fine. 1888, St. Louis. Stock certificate for forty-two shares. #111. Black. Issued to, and signed on verso by, JAY GOULD [(1836-1892). American financier, railroad developer and speculator.]. The Terminal Railroad Association was at the center of an anti-trust suit brought on by the Jay Gould’s scheme to utilize this and other companies as a means of controlling traffic across the Mississippi river and each side of St. Louis. Fine. 1865, New York. Stock certificate for 100 shares. Light purple text on white paper with attached adhesive revenue at bottom. 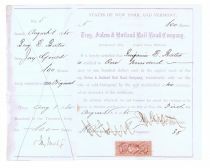 Signed twice, as President and on attached stub by Jay Gould (1836 - 1892) Railroad magnate; Financier; Stock market manipulator. Gould began his rise by gaining control of a small Vermont railroad in 1860 at the age of 24. Over the next 10-15 years he made a fortune by buying and selling railroads and manipulating their stock. His most famous railroad battle came in the late 1860s when, along with Jim Fisk and Daniel Drew, he struggled for control of the Erie Railroad against "Commodore" Vanderbilt. Gould went on to become "the most hated man in America" when his attempt to corner the gold market caused a panic termed "Black Friday" in September 1869. Turning towards western railroads in the 1870s, he came to own or control numerous roads, including the Union Pacific and Kansas Pacific. It is estimated that he controlled about 10% of the railroad track in the U.S. by 1880. He went on to gain control of the Western Union Telegraph Company, and the New York elevated railroad. At his death, his fortune was estimated to be $72 million. Issued to Benjamin E. Bates (1808-1878) a New England industrialist and philanthropist, who was the namesake and a founder of Bates College and the Bates Mill in Lewiston, Maine. Bates College was founded in 1855 by abolitionists. Bates College is one of the first colleges to be coeducational from establishment. The college is also the oldest continuously operating coeducational institution in New England. Glue residue at left from stub. Pen cancellation affecting Gould’s signature as president, his signature on stub is unaffected. Very Fine. 1864, New York. Stock transfer for 15 shares. Black. Signed by Jay Gould (1836 - 1892) Railroad magnate, financier, stock market manipulator. Very Fine. Uncancelled.